There are two reasons patients come to us to have a revisional facelift. The first is to ‘fix’ things that didn’t go well during the first facelift. The second is that it’s time again to rejuvenate the face, and patients want the very latest techniques that will reduce or remove the signs of prior surgery while also rejuvenating the face. A Revisional facelift (secondary facelift, facelift revision) is a corrective procedure that is performed to revise and improve upon the results of previous facial surgery. There are a number of reasons patients elect to undergo Revisional facelift procedures. Some patients seek to refresh or update the results of a facelift from many years ago, while others wish to correct the results of an earlier facelift that they were dissatisfied with. Facelift techniques have drastically advanced over the past decade, and we are now able to create more natural-looking results without the excessive tightness, scarring, or facial distortions of earlier techniques. 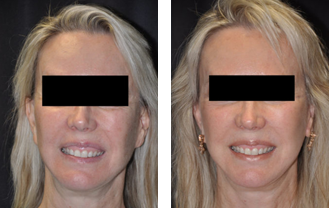 Revisional facelift procedures require an entirely different skillset than for a first time facelift. It’s a bit like an appellate law case vs. a first time case. A higher degree of precision, accuracy, and technical proficiency are necessary than what is required for a traditional or first-time facelift procedures. Many of Dr. Moelleken’s trademarked techniques are uniquely suited to the revisional facelift. In his Beverly Hills and Santa Barbara offices, Dr. Moelleken consults with patients and introduces them to LiveFill ®, the USIC® cheeklift, the NeckLace® and the 360 Facelift®, all techniques designed specifically with the revisional patient in mind. Dr. Moelleken will develop a customized treatment plan for the patient’s Revisional facelift that minimizes or eliminates the signs of previous surgery, enhances the patient’s existing facial features, and restores many of the features of more youthful face. Dr. Moelleken’s advanced facelift techniques incorporate his microsurgery training and vast knowledge of facial anatomy, and are designed to minimize the risk of damaging the delicate facial nerves, which is a potential complication that can result when facelifts are performed by doctors without the aforementioned training and background knowledge. This is critically important with revisional facelifts, because the SMAS (deep layer) is often injured, discontinuous, and in need of repair. Often during his revisional facelifts, Dr. Moelleken discovers that the facial nerves are completely bare, covered only by the skin! Dr. Moelleken will cover those vital nerves with SMAS tissue or LiveFill grafts to reconstruct the normal protective layer. Based on his belief in the importance of effectively hiding surgical scars, Dr. Moelleken carefully assesses the contours of each patient’s face when determining incision placement in order to ensure that the scars are as close to invisible as possible. This usually means removing existing scars and hiding them in seams, carefully reconstructing the tragus, the earlobe, the hairlines, and the direction of pull. Facelifts performed by Dr. Moelleken do not result in the ‘windswept’ or ‘pulled, plastic look’ because he restructures and elevates the deep layers of the face for a subtly revitalized, youthful look. Artistic style is important in a surgeon. Dr. Moelleken strives to do conservative work. To him that means, ‘do as much as you can without causing damage”. Patients may not know technically what the ‘damage’ is, but they know it when they see it. Pulled ears, high or absent hairlines, visible scars behind the ears, altered temple region, pixie ears, windswept appearance, lumpy face. Even if these are present, they can almost always be improved and sometimes eliminated with a carefully done Revisional Facelift. Dr. Moelleken offers a multitude of supplementary procedures (i.e. eyelid surgery, cheeklifts, chin implants, brow elevation, laser resurfacing, grafting to hollow areas, lip lifts, neck tightening, earlobe rejuvenation or earlobe reduction) that can be performed in conjunction with the facelift to create a harmoniously natural surgical outcome and that work to rejuvenate the facial appearance as a whole, rather than as a series of isolated structures. This is a big departure from the cookie-cutter ‘face-brow-eyes’ approach many surgeons were trained with. Lifting the facial skin in a natural direction, but the deep tissues in a vertical direction using the High SMAS technique, thereby correcting the unnatural ‘pulled back’ look that earlier facelift techniques often created by pulling the facial skin vertically. CAN I GET MORE THAN ONE FACELIFT? Yes, a second or even third facelift can often be performed. When the first lift was performed by a surgeon or at a time in history when bad scars and distortion of the earlobes and hairline occurred, a second lift is ‘revisional’ in nature. CAN I REVERSE THE EFFECTS OF A PRIOR FACELIFT? Absolutely! Certain physicians specialize in revision work on the face. There are discreet steps that can be taken during the revision surgery which can restore a normal appearance to the patient, as well as providing further rejuvenation. LiveFill, the USIC cheek lift, hair sparing browlifts or hair restoring browlifts, hairline restoration are all critical elements in a revisional 360 facelift… or a first time facelift! IS THERE MORE RISK ASSOCIATED WITH A SECONDARY FACELIFT PROCEDURE? The biggest risk is in not choosing the right surgeon. Surgeons interested in revision facelift surgery will have a long list of procedures they do, and many before-after photographs to back up their techniques. WHAT BENEFITS CAN I EXPECT FROM A SECONDARY FACELIFT? Patients can expect to look rejuvenated, but less ‘surgical.’ Many patients view this as a life-changing experience because they were self-conscious about their appearance for so long. HOW CAN I TELL IF I NEED A REVISION FACELIFT? If a patients needs rejuvenation of the face, and has aspects from their previous surgery that make them appear ‘pulled’, surgical’ or ‘done’, it is time for a revision facelift by a facelift expert. If you would like to learn more about the Revisional facelift procedure, please contact Moelleken Plastic Surgery today. We look forward to speaking with you, and to scheduling your initial consultation with Dr. Moelleken.